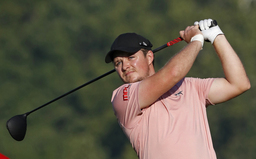 WALTON HEATH, England (AP) Eddie Pepperell won his second European Tour title with a two-shot victory at the British Masters on Sunday and likely secured the even bigger prize of a place in next year's Masters at Augusta National. The Englishman shot an even-par 72 and held off his playing partner, Sweden's Alexander Bjork (71), as the pair went to the 72nd hole at a wet and windy Walton Heath with Pepperell just a stroke in front. Pepperell finished on 9-under 279. Herbert Lucas (69) and Jordan Smith (73) were tied for third, another two shots behind Bjork. English pair Sam Horsfield (69) and Tom Lewis (70) along with American Julian Suri (74) tied for fifth, one shot in front of tournament host Justin Rose (70). The victory takes Pepperell into the world's top 35 and almost certainly secures a first appearance at Augusta in 2019. The top 50 at the end of the year are guaranteed a place in the first major of the year in April. Ryder Cup star Tommy Fleetwood (72) finished 2 under in a seven-way tie for ninth. Pepperell was ranked outside the top 500 as recently as May last year, but won the Qatar Masters in February and followed a runner-up finish in the Scottish Open with a tie for sixth in the British Open seven days later, carding a closing 67 at Carnoustie despite saying he had a hangover. His three-shot overnight lead was down to a single stroke on Sunday when Bjork covered the front nine in 34 and Pepperell three-putted the ninth, the same hole where he enjoyed a spectacular hole-in-one on Thursday. However, the 27-year-old Pepperell promptly holed his second shot to the 10th from 122 yards for an eagle to move three clear and a par save from off the green on the 14th looked to have sealed the win. There was still time for some late drama, though, as Pepperell dropped shots on Nos. 15 and 16 to see his lead cut to a single shot, but Bjork bogeyed the 18th after driving into the heather and Pepperell saved par from a greenside bunker.